With new channels inbound and an influx of venture capital, FuboTV is worth keeping an eye on. FuboTV doesn't have the name recognition of other streaming bundles, but it’s been quietly building up a service to take on the likes of Dish’s Sling TV, AT&T’s DirecTV Now, and Sony’s PlayStation Vue. Although FuboTV originally launched in 2015 as a streaming service for soccer fans, it later pivoted to a broader mix of streaming cable channels, and has been flying under the radar as a public beta for most of this year. Over the past couple weeks, though, the company has made lots of noise, announcing plans to add channels from CBS and Scripps Networks, and closing a $55 million investment round. FuboTV's Premier package currently costs $35 per month, but that rate that will eventually rise to $50 per month for new subscribers. (It's unclear when the price will go up, though existing subscribers will get to keep the old price.) The plan places a heavy emphasis on sports, with regional coverage from Fox Sports and Comcast SportsNet, along with national sports channels such as Fox Soccer Plus, Golf Channel, beIN Sports, and NBA TV. 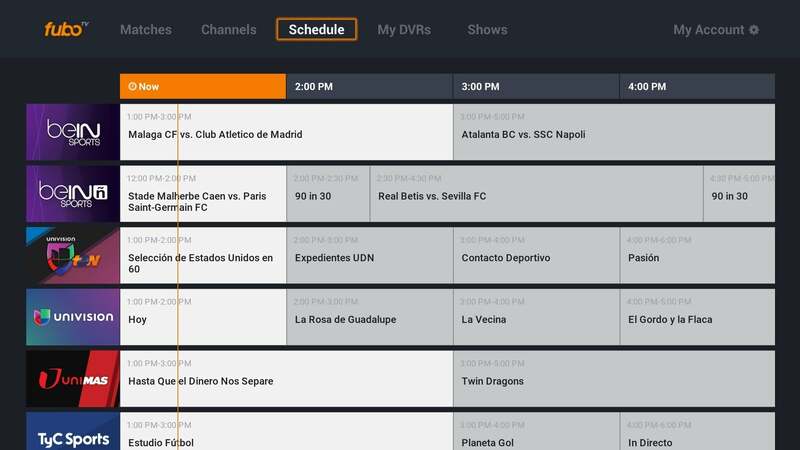 FuboTV also includes a mix of general entertainment channels in its main plan, and it sells some add-on packages that largely consist of Spanish-language channels. There are, however, a few major omissions for sports fans: Disney isn’t on board with FuboTV, which means no ESPN channels or ABC broadcasts, and there are no Turner networks such as TNT and TBS, which provide lots of NBA coverage. Fubo also lacks the NFL Network. On the entertainment side, Fubo doesn’t include AMC Networks, Discovery Networks, Viacom, or Turner channels. See the full FuboTV channel list at the bottom of this story for more specifics. The best way to see what regional sports channels FuboTV offers in your area is to visit the sign-up page, which should attempt to find your location automatically. You can also view a list of regional networks on Fubo's support site. FuboTV's app for Amazon Fire TV devices. FuboTV includes live broadcasts of Fox and NBC channels in a small number of markets, with CBS and CW coming soon. But unlike other bundles, Fubo doesn’t include on-demand programming from these channels in markets where the live feed isn’t available. Head to Fubo’s sign-up page or visit this support page to see which ones are available to you. 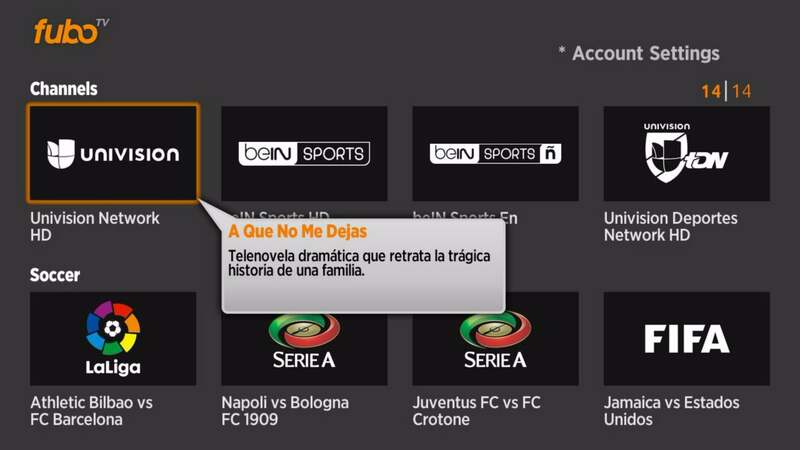 FuboTV offers DVR service at no extra charge, but it's a bit convoluted compared to other streaming bundles. Instead of providing a certain amount of recording time, FuboTV provides 10 DVR slots into which you can store any sporting event or TV show. The number of events you can record at once corresponds to the number of free slots you have remaining. FuboTV’s DVR has a couple other limitations: Recordings only become available 30 minutes after the live telecast is over, so you can’t start watching an event from the beginning while the recording is still in progress. Those recordings also expire after 10 days. On the plus side, if you decide to record a program midway through the live telecast, Fubo will save the entire thing from start to finish. For sports, you can watch a smattering of events from the previous three days without having to set up a DVR. Most of Fubo’s entertainment channels also offer TV episodes on-demand, though some channels, such as History and Viceland, do not. If there’s an upcoming episode you don’t want to miss, it’s best to set up the DVR. Fubo currently offers apps for Apple TV, Roku, Amazon Fire TV, Android TV, Chromecast, iOS, Android, and the web. Only Fubo's mobile and web apps, however, currently offer on-demand programming and full DVR features. 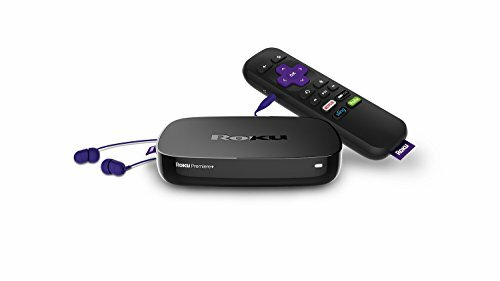 And its Roku app uses an old template-based design that lacks a proper channel guide. FuboTV's Roku app isn't pretty. 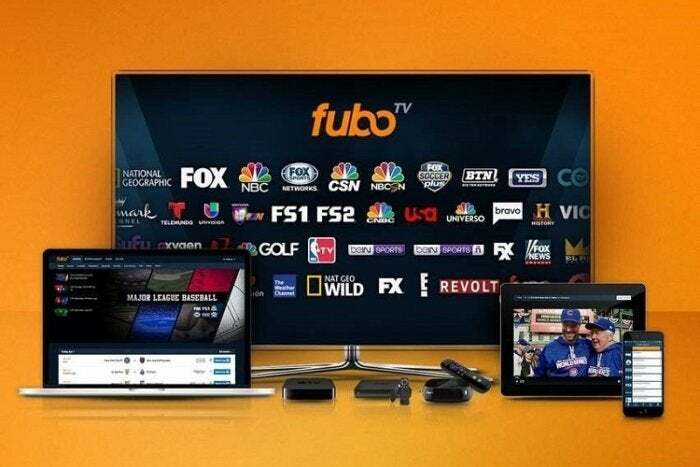 The good news is that FuboTV supports nearly 30 TV Everywhere apps, so you can sign in and watch on-demand video even on devices that Fubo doesn't support with its own apps. Check the support site for a full list. Compared to other bundles, FuboTV claims to stream at lower latency, so you won’t notice a huge delay if you’re checking social media (or hearing cheers from a neighboring apartment) while watching live sports. In a brief test, Fubo’s FS1 feed was more than 40 seconds ahead of PlayStation Vue, and more than 30 seconds ahead of Sling TV. But for frame rate, Fubo only hits 60 frames per second on Fox Sports channels and BTN. 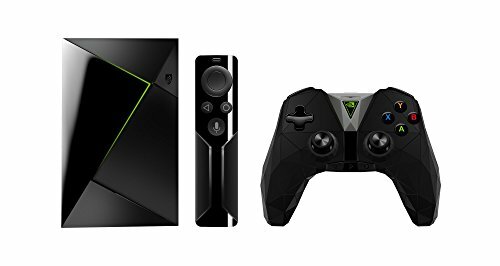 Other streams are stuck at 30 frames per second, resulting in video that’s not as smooth as cable for sports, news, and talk shows. My snap impression is that FuboTV's emphasis on sports is refreshing, especially because sports are what live TV bundles are best at. A list of live games is the first thing you see when launching Fubo’s apps, and the channel lineup provides a lot of interesting sports to choose from beyond the usual Football-Baseball-Basketball trifecta. Still, the apps themselves need a lot of work to reach feature parity with Fubo’s mobile and web offerings, and the DVR restrictions don’t mesh well with Fubo’s general entertainment channels. We’ll have a full review of FuboTV in the near future. In the meantime, find me on Twitter with any questions about this service or any other streaming bundle. Correction: This article previously suggested that Premier would eventually cost $50 per month for existing subscribers, rather than just new ones.